The St. George Marathon accommodates up to 7,400 runners. All runners, male and female, from any nation, may submit registrations to run; but only 7,400 runners are selected by random lottery to participate. Runners must be able to complete the race within six hours. The race begins at 6:40 AM for wheelchair participants, and at 6:45 AM for runners. The course starts in the scenic Pine Valley Mountains at an altitude of 5,240 feet (1,598m), and descends nearly 2,600 feet (792m) through varied scenery, including the formations of spectacular white, pink, and red sandstone and black basalt in Snow Canyon State Park. The race finishes in Vernon Worthen Park in St. George City at an altitude of 2680 feet (816 m). Morning temperatures usually range from 38°F to 44°F (3°C to 7°C), while temperatures at the finish typically range from 65°F to 85°F (18°C to 28°C). 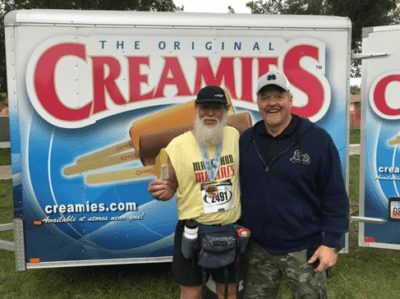 As an ice cream company, we love to hand out ice cream bars at marathons. People are hot from running and ice cream is the perfect treat to cool down. Runners love eating our healthy ice cream bars after a long, difficult run. They are made with real ingredients and make for one tasty treat to reinvigorate yourself after a long run. Typically, at marathons, we like to provide our Originals. They are the best ice cream bars you can find. Our originals include chocolate, orange, and banana. 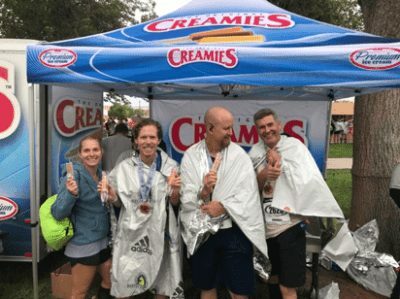 If you are ever at the St. George Marathon please come by our tent and grab yourself and your family a free Creamie-they are delicious. To request Creamies at an event near you, please contact us through our contact page and we will get back to you ASAP.